A few weeks ago I posted “Because MacMule,” but this is only part of the story. Not only have the Mac Admin community greatly assisted me over the years, but that post did a disservice to the company I work for as i neglected to mention them. That company is Pentland Brands & you’ve probably never heard of us. But please take a moment to look at our recently re-launched site to get a real flavour of the company & it’s values. You should be familiar with a few of our Brands, & I hope you watched the video to really get a feel for Pentland. If you’ve met me you’ll know that the values & culture hinted at in the video are very much alive & well within Pentland’s walls. First up, I’d replace the beginning of the last paragraph with “He is active in the Mac community…” as i’m no leader, just vocal!!.. but I’ll let that slide (we’ll keep the truth our little secret). Paragraphs 2 & 3 both mention improving & stabilising the Mac estate, this took me back as these are often areas where as an Admin we’re not applauded as we’re only noticed when we’re needed due to an issue. The biggest compliment came when I was told that one of those was submitted by our Marketing Executive & not a member of IT! So not only was I being recognised for bringing stability, but again but the people whom I support even though i’m not fighting fires. 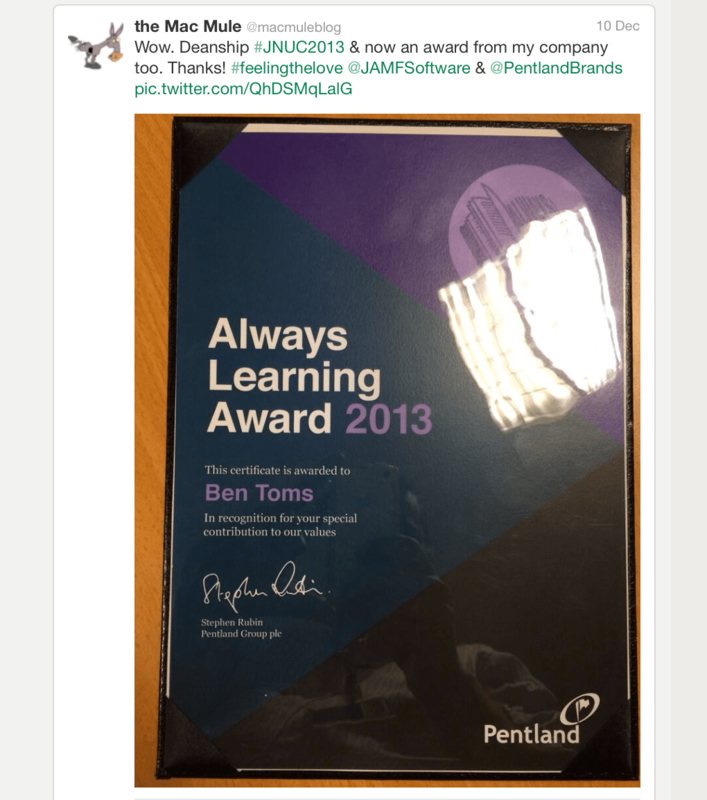 Lastly, “Always Learning” is one of our core values & if i’m far from infallible so I find it rather fitting!! Allow me to keep posting here. Pentland delivered on both, & I think i’ve just got some validation that I’ve delivered too. If it wasn’t for the culture within Pentland allowing me to develop & post here I think i’d have half the skill set I do now. Also this culture this is indicative of the fact that i’m not the only one within our IT team whom has “presence” in their respective IT communities with other talking & hosting conferences/user groups as well as being invited to other businesses as part of “Bringing the Outside In” initiatives. So what an interesting past few months it’s been! Going forward i’m having the doors widened at home to allow for my ever expanding head.. I also need to post here more (hopefully around new years you’ll see a flurry of posts) & am trying to use this “status” as a launch pad to see if we can host a User Group / Conference on site in April (Watch this space! ).